Music Sourced: Music Experience Part 1: Death of the Music Industry? Music Experience Part 1: Death of the Music Industry? In the past few years, there has been a lot of discussion about the music industry and where the current trends are heading. A large part of that conversation has been directed towards what kind of physical media will the music be distributed on. A lot of marketing and development goes into trying to stay current and relevant with the most attractive means to provide music for the consumers. 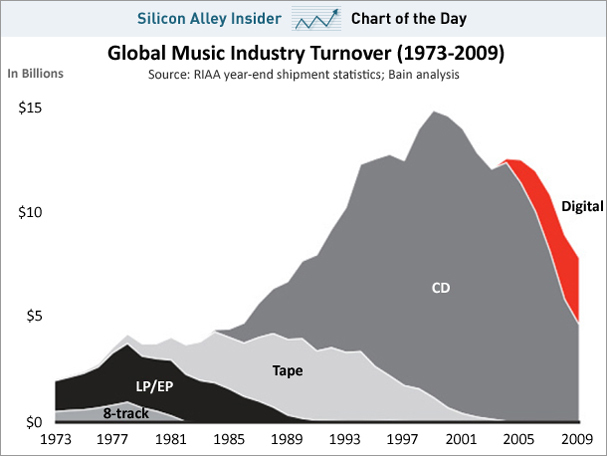 Check out the graphic below that Business Insider titled "The Death of the Music Industry" that details the billions of dollars in sales that were generated from consumer purchases of physical media and digital downloads. You can see that a lot of money is represented from the years 1973-2009. You can also notice that the money generated from music sales have drastically increased during nearly the entire span of this chart all the way up until the year 2005. This makes a lot of sense because there is more music, more artists, more consumers, media is more expensive, and eventually the INTERNET arrived. 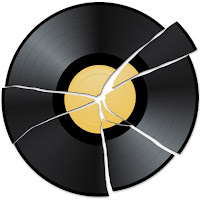 However after 2005, music sales have declined to a level that appears to be equal to the early 90's when CD's and tapes dominated the market (around a combined $8 billion dollars according to the chart). So what's going on here? Is music falling dead upon the ears of the younger generations? Are people just illegally downloading billions of dollars worth of music every year? How can this be rationally explained? The big picture here for most people is that physical media sales are declining. We have all known this for a while but in the terms of legendary radio broadcaster Paul Harvey, what is "The rest of the story"? The biggest explanation for me is the arrival of media-on-demand with the use of the Internet. Think about it, what do you do if you want to listen to a newly released CD or maybe the hottest new single that all your friends are talking about? Do you drive to the nearest music store and preview it? No. Do you turn on the radio and just wait for it to be played? Absolutely not. You instantly stream it from your Internet service of choice! YouTube, Pandora, Grooveshark, iTunes, Amazon to name a few. Internet music services have laid out a huge punch to the face of CD sales which is where the bulk of the money is made in the music industry as shown above. And this not only holds true for music, but all types of entertainment media like movies and TV. We are well into the age of streaming movies and TV shows to all types of devices (Computers, TV's, Cell Phones, Tablets) from providers like Netflix and Hulu. People are even starting to cut the cords from cable providers and only using Internet streaming services to view their favorite content. The same holds true for the music industry as people are passing on physical CD's and now even digital downloads for instant streaming services. The biggest problem that this creates is how do bands generate interest in their entire body of work if people are just using iTunes to purchase a bands newest single? Before it was easy, if you liked a song from a band, you purchased their entire album. Those days are now long gone and unless your band is a supreme pop-hit sensation, you can't survive on this platform alone. A quick update here regarding the chart that was originally provided in this post from Business Insider. 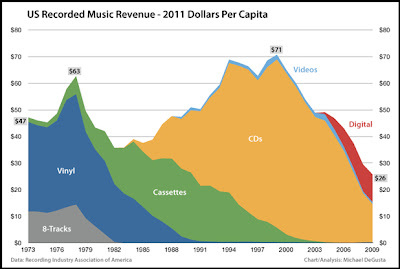 Some additional analysis has been performed by Michael DeGusta to attain a more accurate view of recorded music revenue while considering population changes and inflation. The chart is shown below but the results are the same. The chart shows that music revenue is down 64% from its peak. Also, click the picture below to see the full article which provides many more charts that and views of music sales over time. This is very interesting and very informative.